I hope that today’s theme for Black and White Sunday will not give you a headache. You are invited to post a portrait photo (photos for those that can’t do a single image post) of someone or something. You have time till next Saturday. I will start looking at your entries on Monday morning. Have a good day! Thank you, Christian. I have just seen your work. I like it a lot! Thank you, Colline. I love most animals. No headache from this lovely just some heart melting. Fantastic image Paula! Many thanks dear Sue. I so prefer animals to people. What a handsome chap! 🙂 🙂 Have a peaceful Sunday, Paula! You too, Jo and a great week ahead! Oh what a fine goat, Paula. You’ll be getting another railway man from me shortly. Wishing you a good Sunday. Oh, sorry I can now see the pingback. The font is too small here 😀 Tish, thank you again for posting that jolly chap for my challenge. How weird about the pingback being small. The mysteries of wordpress. Glad you liked my man though, Paula. It is just as small as other pingbacks. Thank you, again, Tish. I need to have breaks from computer on weekends, cause I have to use it for many hours during the week and it takes time before I see your responses. Not too much of a headache! I’ll be back tomorrow 🙂 Happy Sunday Paula. It seems that you are his role model. I love this in B&W Sue! Great capture … your photo says pick-me to photograph. Happy Sunday …. Thank you for hosting, Paula. Thank you so much Isadora. I can see that her costume is colourful and I like it, but the B&W portrait you took is outstanding. Thank you very much for the lovely portrait, Lisa. It shows that you know your subject well. Have a great week! Thanks Paula- and for the opportunity to share it! I appreciate your comment, Marie. I don’t know who the lovely subject in your photo is, but you did her portrait beautifully. Thank you very much for joining in the challenge. Yes! He has that “old man” look about him. Speaking of old men, I like your candid shot too. Thank you, Brenda! Love your goat. I think he’s smiling. Oddly enough, I took this picture today and did it in black and white because black dogs somehow come out better in monochrome. Yours is adorable. Thank you. This has made me very smiley. Hehe. Not exactly what you’d expect with a title like that. I have some similar photos at home, I’ll see if I can post one of them for your challenge. Thank you, Lynne. Yes, ping-backs are rarely enough, that’s why I always say to leave me the links bellow. Besides, I am not one of those challengers that does not display links to the entries or who avoids to look at the participating posts. And of course if one wants their post seen and commented, the logical thing is to first comment on the challenge post. Also, you should check out your spam folder. Many comments have ended up there lately. I guess he is. I wasn’t close enough to pat him, but he looked very placid. Hi P – your guy featured here looks so well groomed – the hair looks gently brushed and he looks like he is smiling. such a sweet vibe. Takk Dina. Klem til deg. 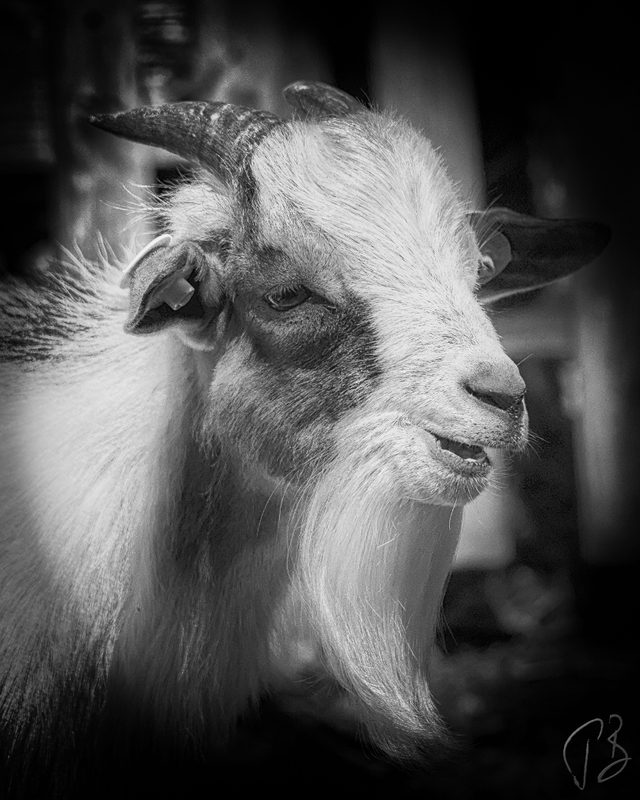 Awesome goat-ee portrait! 😉 Enjoyed the music, too! 🙂 very glad to know that 🙂 Have a good day, Linda. Maybe you could take a portrait shot of some of your cats? So far, all portraits are cell phone digitals! But one of these days I just might break down and buy a “real” camera! LOL! I do have some that I’m thinking of transferring to canvas. He knew I was coming and had made the stylist appointment before. I’m touched Sylvia. I can only imagine how much you must miss him. Thank you for the beautiful shots.